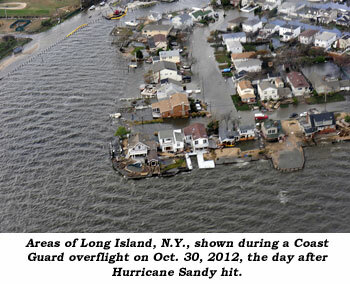 Will Hutchins remembers Hurricane Sandy. Breeze, and there went the neighborhood. Over 100 homes burned to the ground. At Planting Field Arboretum in Oyster Bay, Long Island, over 350 trees were damaged, including the loss of a 90 foot tall Nordman fir. Our lovely neighbor Leigh Weyrheter, statuesque and strong, works there, sawing and chopping all day. Night falls, and so does she—plop—into bed, exhausted. The Jersey Shore, Manhattan, Brooklyn, Staten Island, all hard hit. 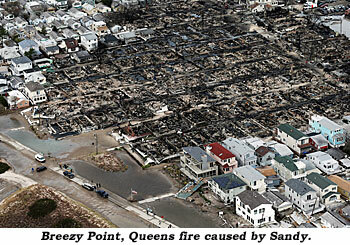 We lost 13 lives here on Long Island during Sandy’s brief visit. Anne Marie Dolan, 55, of Commack, a former teacher, lived in a tent in the woods. That’s what she wanted. She was a free spirit. She pursued the life that made her happy. On November 4th, she went to sleep and never woke up. A tree fell on her tent. Edith Wright, 52, of Montauk walked along the beach with her daughter’s dog. A monster wave swept them out to sea. They were found days later, 16 miles away. Hundreds of friends celebrated her life, just as she wished: “I don’t want an open casket. I want an open bar.” Louis Bodi, 87, Glen Cove, retired college provost, endured six days without power. He lit a kerosene lantern and by accident knocked it over, setting himself and his home on fire. His wife threw water on him. She couldn’t call 911. The phone was dead. Flames and smoke forced her from the house, destroyed, except for the basement. Vishwaja Muppa, 21, a co-ed at Stony Brook University, dreamed of becoming a doctor. She was a back seat passenger in an SUV with four fellow students. They came to an intersection. Traffic lights out. A police car struck them. Muppa died on impact. A friend said, “I always thought she’d go far. This is a reminder not to take life for granted.” 13 Long Islanders lived, loved, and ran away. How many aching hearts did they leave behind? Where were you when the lights went out? October 29th—Frankenstorm! “Babs, we’re gonna get hammered!” Hmmm, not a bad idea. Ka-flooie! The Mother of all blackouts. Where’s Alec Trician when you need him? We’re powerless. What would the Amish do? In town, all the battery-operated lanterns are sold out. Babs is my Stella by flashlight. I’m her Prince of Darkness. Ooo—Dark and dank. We’re like pre-historic cave dwellers. The wind whops and whups. Next stop, Oz. The trees pound our walls. “Go away! You can’t come in!” Look at those trees—They sway like a corps de ballet. Our little radio is our contact with the outside world. That, and our landline telephone upstairs. We have no idea of Sandy’s magnitude. Worried compadres call from all over. Kelo and Gail Henderson, Johnny and Jo Western, Boyd and Donna Magers. On national TV our ravaged land looks like Armageddon. Yeah, well, Armageddon mighty tired of all this chaos. Babs and I are deeply moved by the compassion of our neighbors. We transfer the contents of our fridge to an ice chest, kindly contributed by the lady across the street. Folks next door invite us over to bask in the warmth of their fireplace—coldest I’ve been since Aunt Maude and I got stuck in a meat locker. Babs and I sleep under a pile of blankets, fully clothed. More layers than a chicken coop. Aw, Babs sleeps in her cowgal outfit. You’d think, wouldn’t you, she could remove her spurs? Our local baker gives us free soup. Rob the owner invites us to stay with him. He has power. Ditto Babs’ boss, Barbara. Ditto JoAnn, the great gal who cuts our hair. Ditto Vernessa, the check-out lady at our local supermarket. We respectfully decline. We have seven (count ‘em, 7!) cats to feed. At least, we can shower. We have hot water. A lot of folks don’t. FEMA sends a helicopter to fly over our neighborhood, spraying us with cologne. Long gray lines of cars on the main drags at night. Slowly they move, inch by inch, to the oases of gas stations. Our street is festooned with fallen trees, limbs, and bushes curbside. Bless Oyster Bay. Boyz in big trucks rumble along, clearing the debris. Our yard suffers more from the ensuing Nor’easter up the keester than from Sandy. An eerie sight. The heavy snow makes the trees and bushes sag like white weeping willows. Weird and wild, a flick on location is put on hold. Extensive storm damage to a huge boat. The flick is called “Noah”. Our street keeps calling LIPA. “When the hey do we get our power back?” “Manana.” Yeah, sure. I dub our street The Boulevard of Broken Promises. I buy so many batteries that I run out of cash. So I charge ‘em. No washer-dryer in operation in our house. Yikes! Will I have to wear my jockey shorts inside-out? Our cats cuddle with us on the sofa. Foul weather friends. Well, it’s a bee-oo-tiful day. Walter Winter is in his glory. Babs and I are sure lucky to have so many angels in our lives. Long Island is lucky to have so many angels pitching in and rebuilding. We’ll be Phoenix East in no time, rising from the ashes. Ol’ Sandy’s called “The Perfect Storm.” Perfect?! Babs and I rate Hurricane Sandy arf-ful. We made it through hurricanes Irene and Sandy. What’s next? Hurricane Foopsie?